Whether you are doing offline marketing like a mailing or online marketing like a Google Adwords or Facebook ad, a landing page makes marketing easier to track. If each marketing activity has its own landing page, you know that the people who visit your page learned of it from your marketing activities. The same isn’t true for your website – people might have visited that for a variety of reasons. So, you know that any visits your analytics shows you are getting came from your marketing efforts. And you know the same of any forms filled out and any customers that result. That means, assuming you know the value of that customer, you can calculate your ROI for that marketing effort. If your LinkedIn ad resulted in 3 new customers worth $500 each, and you paid $500 for the ad (including landing page and ad creation), you know you got your money’s worth. Really savvy businesses will also use a different phone number on the landing page than the one they use on their main site. This means you can even track the phone calls resulting from your online marketing. 2 Landing pages make visitors more likely to convert (fill out the form). Landing pages do a better job of relating to a specific marketing activity than a website typically will. You can match the language, imagery and colors on the landing page to those used in your ad. This is very important because, typically, if a customer can’t tell that they are in the right place in only a few seconds, they will leave. In addition, you want to be sure your visitor knows what action you want them to take as a result of the visit (call or fill out a form, usually). And you don’t want them to have to click to any additional pages to complete that action, like click a link to get to a contact form. Every additional link they have to click results in fewer conversions. In addition, you want to be sure your visitor knows what action you want them to take as a result of the visit (call or fill out a form, usually). And you don’t want them to have to click to any additional pages to complete that action, like click a link to get to a contact form. Every additional link they have to click results in fewer conversions. You also don’t want to have a lot of distractions to the visitor before they fill out the form. For example, if you have links to other products and services, news stories, etc., the visitor might not every get around to filling out the form. And, with a landing page, you can make sure that the visitor has every piece of information they would need to decide whether or not to contact you on one page. You can include a map, testimonials, product details, specials, images, social proof – all things to make the visitor feel comfortable doing business with you on one page. For these reasons, landing pages usually do a better of convincing visitors to convert to leads or sales. So, what makes for a really great landing page which will result in lots of conversions? Well, it varies for every industry and company, but there are some things which are generally constant. Do NOT include a lot of links to other pages of your site or other resources. This is the one case where this is true – usually you want lots of links on pages of your site. But in the case of a landing page, you don’t really want the visitor to click away from the page you created. Include a contact form which appears without the visitor having to scroll down on the page. My article on Minimum Web Site Features for Internet Marketing, includes recommendations for a contact form. Your landing page will include a contact form so you want it to be as well designed as the generic contact form on your site. I recommend that you read item #8 of that post for more contact form tips. Provide testimonials. You can pull them from social media or a file of testimonials that you keep, but testimonials help visitors feel more at ease with taking the next step to becoming a customer. 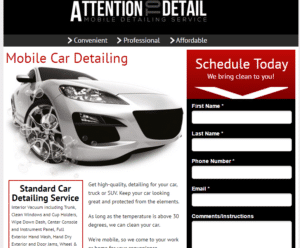 Ideally, you want the testimonials to be about the same product or service you are advertising on your landing page. Ask search engines NOT to index your landing page. You don’t actually want organic search traffic to find your landing page as it will skew your marketing data. The whole point is to know how effective a particular piece of marketing is, after all. Perform A/B testing! There are lots of programs out there which will make this easy to do and I highly recommend it. I have seen enormous gains in conversions come from A/B testing – I’m talking 800% improvements sometimes. You can test, find the best version, and test again until your landing page is incredibly effective. You can make changes to the imagery, colors, positioning of the elements, number of form fields, number of required fields, etc. Each change can potentially have big impacts on the conversion rate. So now you know what landing pages are, how to use them, and how to make them effective. Do you plan to implement landing pages as a strategy for your business? Let us know in the comments below. 5 Pings/Trackbacks for "Landing Pages: 2 Reasons to Build & 5 Ways to Make Them Great"